Do you have special Christmas traditions? We buy a new Christmas Tree ornament each year and make Christmas decorations too! 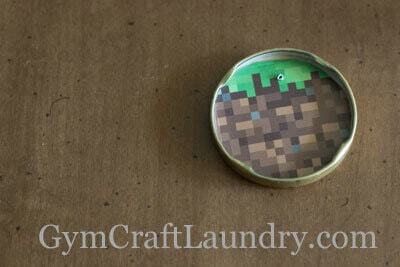 This handmade Minecraft ornament is a kid favorite in our house. I want to pick up our ornaments twenty years from now and remember what some of the highlights of 2014 were in our family. other. Though, I could do without the bickering and accusations over who started the fire in the other’s world. I have been seeing mason jar ornament kits at the craft stores and some on Pinterest but I was reluctant to buy jar lids. Because who buys jar lids??? I may or may not have a gallon size ziplock of just jar lids…. Disclosure: I have included Amazon affiliate links for your shopping convenience. 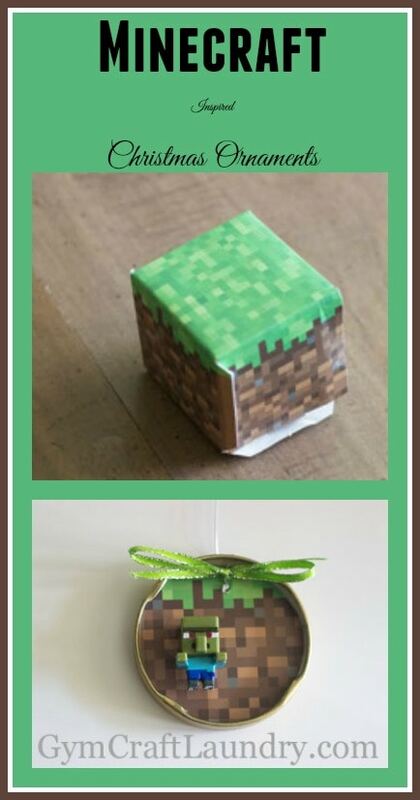 Paper Minecraft block or you can search and print out Minecraft blocks. The kids only helped a little with this ornament. And by helped, I mean they went through their minifigures and hid all of them except a zombie villager and a red sheep. Guess they don’t like these two much. Pork Chop did donate a paper grass block to me with great reluctance. He made me promise to only take one of them. First I painted the back of the jar lid with the acrylic paint. 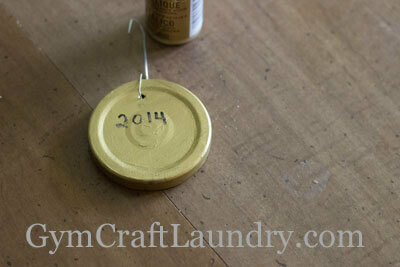 After it was dry I punched a hole in the jar lid with the hammer and nail for the ornament hanger. 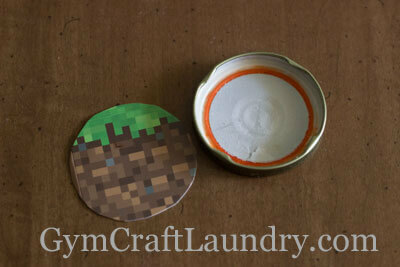 I traced a circle in the Minecraft paper block and cut it to fit inside the jar lid. 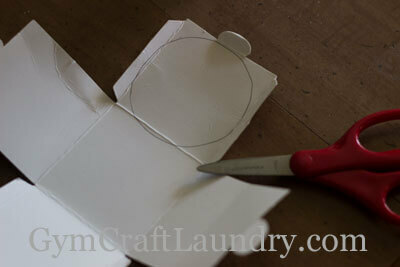 The way this lid is built actually held the paper but you can use glue or double sided tape if yours doesn’t stay put. I positioned the minifigure where I wanted it and used a very small amount of super glue to hold it in place. This really took only a few minutes to make. Simple and pretty. Merry Christmas! 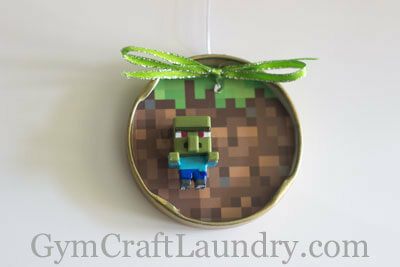 Do you know any kids that would love this fun handmade Minecraft Christmas Tree Ornament? Lol i’m think of making one with tiny pinecones in it. 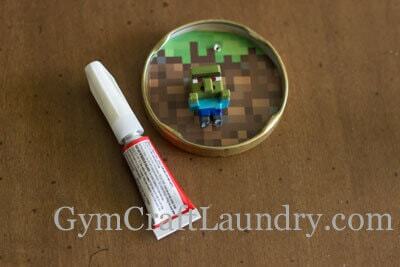 You can easily do this craft in hundreds of ways! These are so awesome! I need to make these with my son! Echo recently posted…Let’s Paint A Snow Storm! So cool. My kids are huge fans of Minecraft. Cute! My kids don’t do Minecraft, but they just got into Pokemon, so maybe they’ll try it in a few years! P.S. I may have a whole bag of jar lids sitting around my kitchen, too. WHY!?!?!?! I’m totally in love with this! My 12 year old would be so happy if we made this! Pinned and tweeted. We appreciate you being a part of our party, and I hope to see you on Monday at 7 pm. We love partying with you! How cool! These turned out great!